It has been a couple of “rough” weeks managing the diamondback moth (DBM), Plutella xylostella (Lepidoptera: Plutellidae), in the Central Coast. Based on my conversations with some PCAs, we are managing large populations of this moth, resulting in high infestations in cole crops like broccoli and Brussel sprouts. Larvae of this insect will typically feed on the underside of the leaves, rasping the epidermis and generating this characteristic “window panning” that results on perforations later on (Fig. 1). Diamondback larvae will also feed on the plant's growing points, floral stalks, and even on flower buds. Fig.1. 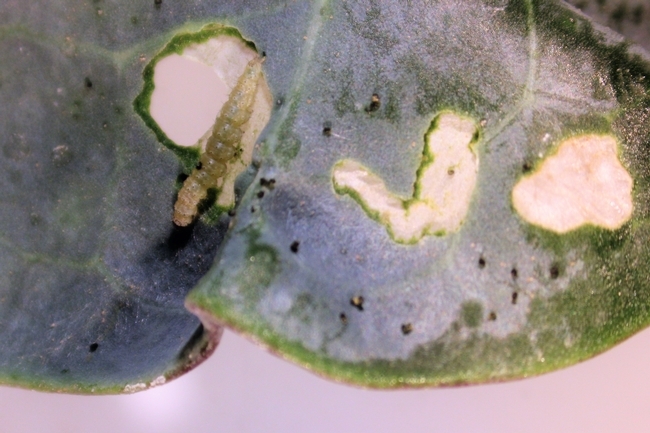 Characteristic window panning injury from Diamondback larva feeding on a broccoli leaf. It seems like populations have been building up during early summer in our area, resulting in enough individuals, at this point, generating significant injury in cole crops. PCAs have been recommending spraying several different insecticides to reduce the infesting populations in affected fields, since damage has been beyond tolerable. 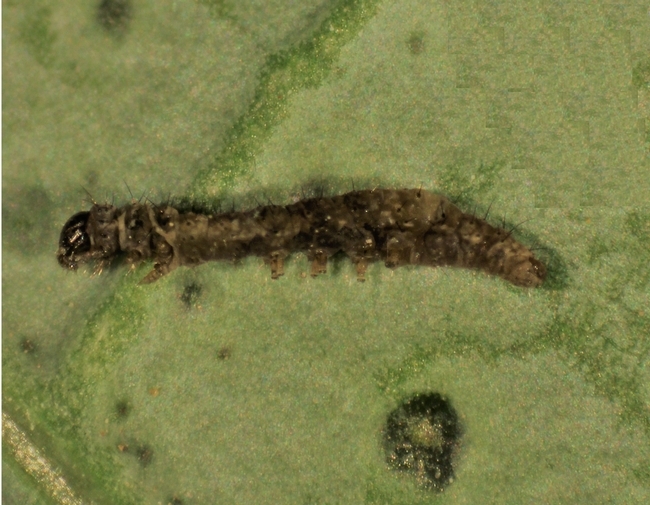 For instance, after one of my field visits, I was able to spot affected larvae in treated fields (Fig. 2). Treatments are working, I believe we need to continue being ahead of future DMB infestations. Fig. 2. Dark colored insecticide-poisoned and dead Diamondback larva collected from an insecticide treated broccoli field. Scout early. If you have transplants or direct seeded seedlings, pay a visit more often. We are dealing with a large DBM population right now. There will be a high chance that those fields may ended having DMB earlier than expected during this time of the year. Use of adjuvants. The waxy nature of cole crop leaves represents a challenge for insecticide deposition in the canopy. Make sure that you are using a spreader/sticker adjuvant to potentially reduce any pesticide “sliding off” from the waxy leaves. Rotate pesticides. Consider using different classes of insecticides, before using different active ingredients within the same class. For instance, using an avermectin and then a diamide, instead of using chlorantraniliprole and cyantraniliprole (two different active ingredients within the diamide class) back to back. Using different modes of actions will help to delay potential issues of developing insecticide resistance in our DBM populations.